Architects may be limited in their power to prevent climate change, says Peter Zumthor, but they can help by designing buildings to last for centuries rather than decades. Zumthor spoke to Dezeen on a tour of his recently completed Secular Retreat villa – a concrete and glass holiday home in Devon, England. The tour took place shortly after the UN issued the warning that we have just 12 years to reverse the impact of global warming, to prevent global catastrophe. The Swiss architect said the issue was on his mind, but that he didn't feel he had much power to make a difference. "I am aware of these things, but I can only do so much," he said. "What I do, I do simple buildings," he continued. "In my modest way, it is a big concern." "These materials produce a nice ruin"
One thing Zumthor said he tries to do, to make his buildings more sustainable, is to ensure that they will look and function in 100-200 years time. This was the case with Secular Retreat, he explained. "We started, in a way, by supposing that in 200 years time it is still in good condition," he explained. "It's the opposite of the fashion shop, changing its interior design every half year. In that sense, there's an ecological element." "I think these materials we're using here produce a nice ruin," he added. "All the materials are very basic: wood, stone, steel. The only thing I don't know about here is the glass, how this three-layered glass will hold up. That's the price you pay to have large windows." "It's a big concern that I have to fly"
Another way that Zumthor tries to reduce his carbon footprint, he said, is by avoiding international travel whenever possible. The architect is based in Haldenstein, a mountain village in eastern Switzerland. As well as his UK villa, the architect's current projects abroad include an extension to the Los Angeles County Museum of Art. "It's also a big concern that I have to fly around the world to do my work," he told Dezeen. "But what happens now is that modern IT helps me to avoid flights, so I can communicate with LA and New York and San Francisco at the same time, and we can look at the same plans at the same time." 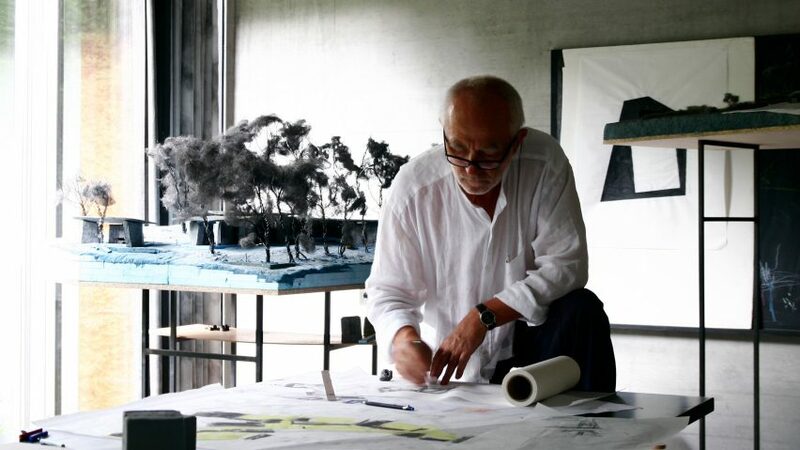 Peter Zumthor is one of the most respected architects in the world, known for buildings including the Therme Vals spa in Switzerland, the Zinc Mine Museum in Norway and the Brother Klaus Field Chapel in Germany. He was awarded the Praemium Imperiale in 2008, the Pritzker Prize in 2009 and the RIBA Gold Medal in 2013. The architect is famously selective over the commissions he accepts, allowing him to keep his studio small. "I get asked to do lots of commercial work and I have to say no, in a friendly way," he said. To date, no building he has completed has been demolished.